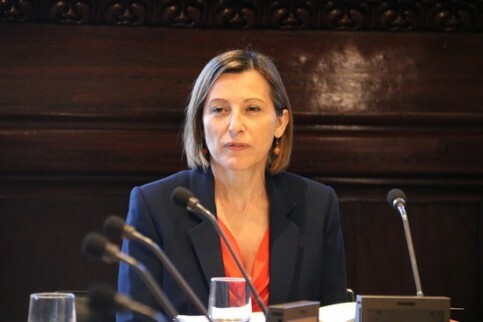 Spain summoned the Belgian ambassador over a letter sent to jailed Catalan separatist Carme Forcadell by the speaker of the regional Flemish parliament questioning democracy in Spain, a diplomatic source said Wednesday. The source, who refused to be named, said the ambassador was summoned on 20 September by the foreign ministry’s Europe director-general. Carme Forcadell, the former president of the Catalan Parliament, currently in jail awaiting trial (ACN). A protest letter was also sent to the speaker himself, Jan Peumans. In his letter, Peumans, a separatist in the Flemish Region of Belgium, described police violence during a banned independence referendum on 1 October 2017 in Catalonia as an ‘outrageous expression of an undemocratic policy’. ‘Keeping (Catalan) politicians under arrest for months is an even more insidious act, a proof that the central government in Spain is not able to meet the conditions to be part of a modern democratic European Union,’ he added. Peumans is part of the pro-independence Flemish nationalist party N-VA.
His letter was handed to the former speaker of Catalonia’s parliament, Carme Forcadell, on 7 September when 13 MEPs visited jailed separatist leaders. Forcadell is one of nine who have been placed in provisional detention on charges of rebellion as they await trial over their role in Catalonia’s failed bid to break from Spain in October 2017. Their detention has sparked debate in Spain. New foreign minister Josep Borrell, a Catalan himself, said earlier in September that personally, he ‘would have preferred’ the judge to take another measure rather than provisional detention.